We are going to close our VST survey and share the final results with everyone. A couple of clear leaders. As it turns out, we have already purchased a couple of guitar samples along with a horn section. 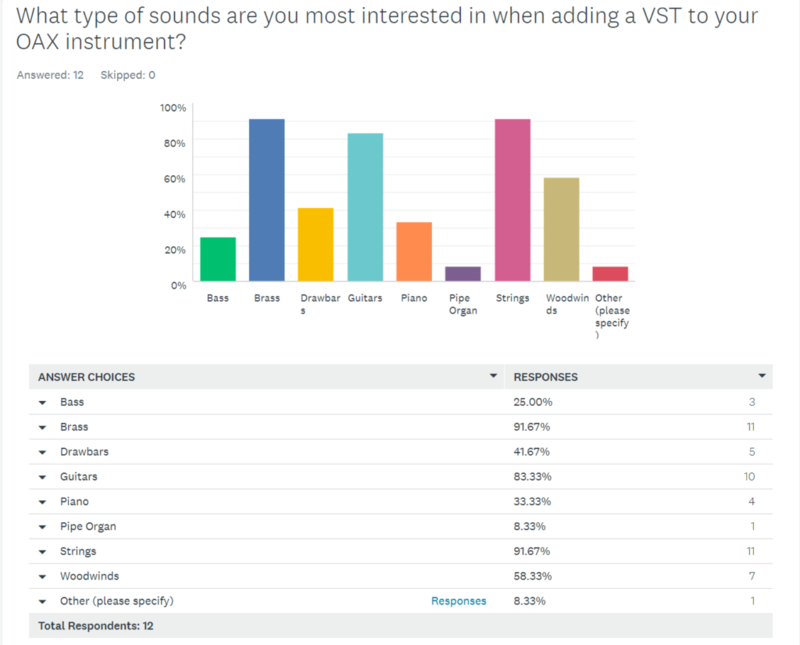 Strings and Woodwinds are on our list of samples to add to our collection in the future. Surprisingly one sound that scored low, Piano, was one of the first samples that we purchased. The OAX pianos are a little too “harsh” for our taste. Today we going to get started on a new video showing how we setup our new samples as User Sounds and a couple of User Presets that will be using those new sounds. To keep it interesting I think we will make up a couple of presets using both VST sounds and some factory OAX sounds. Mix-n-Match, if you will. What Sounds Would You Like?